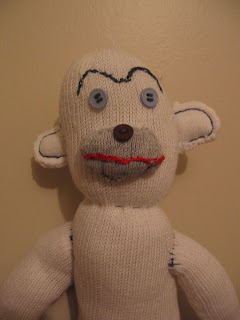 Inder Loves Folk Art: Bad monkey. My attempt to create "Smoking Gun"-type mug shots seems to have failed. I really wanted him to be holding up a booking card, but I don't have photoshop and Steve wasn't interested in helping me with this at 10 p.m. last night. Several friends have eagerly told me that this is not a "bad monkey" but actually quite a nice monkey. No, no. Would you want to meet this monkey in a dark alley? I didn't think so. You wouldn't trust this monkey with your social security number. I know I wouldn't. Should've titled this: "Bad joke." Cute!! I like his groucho unibrow. and his cocked ears. excellent monkey, my friend. oooohhhh. mug shot. i feel like a li'l dummy. maybe "criminal monkey?" hmm. in any case, don't let him near the socktopus. he might be a bad influence. He looks like a cartoon character from my favorite all time comic, "
He looks like Chris Funk from The Decemberists. Okay, Harpal wins the comparison test. That's frickin' awesome. Too funny to find a comment on this ancient post! Oh, hi Jane! Glad you like it. 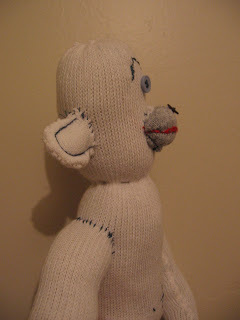 I'm about due to make another of these - this sketchy dude got gifted years ago.